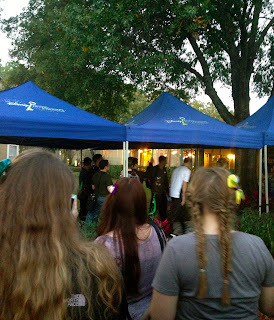 The Disney Den: Crazy Crazy Check-In! Yesterday was probably the longest day of my life! Monday, Sara and I woke up around 4:45 am to drive to the airport in Sacramento and catch our flight at 8:30. We had a layover in Vegas for an hour or so and then flew for four and a half hours to Orlando! We met up with our roommate Briana at the baggage claim and then took a SuperShuttle to the Holiday Inn Sunspree right across from Vista Way. We met with the rest of the roommates in Applebee's inside of the hotel. We all get along really well! After dinner we went back to our rooms, showered, and went to bed at around 1:30 am. Two hours later, we woke back up and got ready for check-in! Since Vista Way was so close to our hotel, the six of us just walked down the street at 4 am and waited in line. There was about 20 people ahead of us, so we weren't too worried about not getting what we wanted. 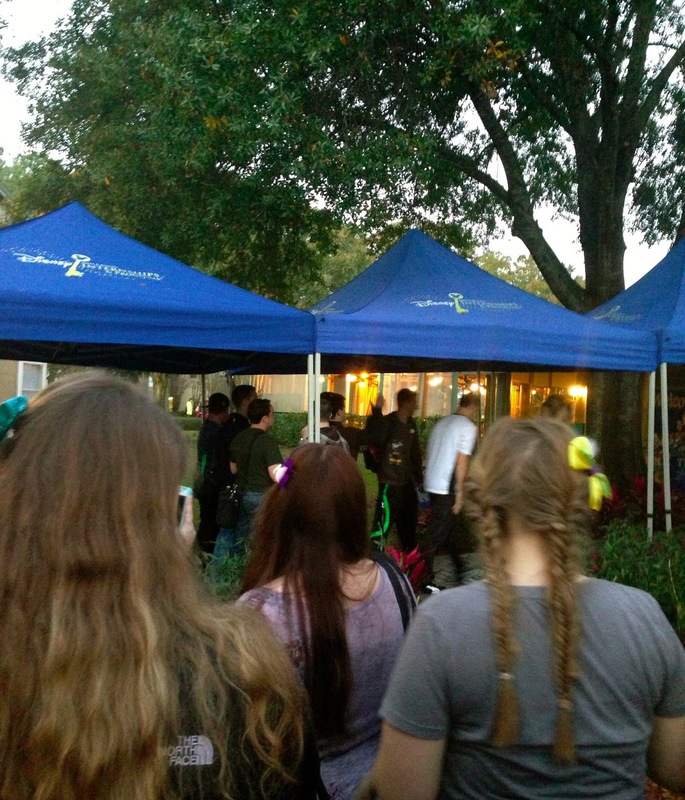 However, as time went by we realized a lot of people were actually saving spots in line for the rest of their roommates, so the amount of people ahead of us grew dramatically. At about 6:30 three of us went to Walgreens to get some food and water. When you're waiting in line for over three hours...you get thirsty and hungry. There's a lot of places for food and water around Vista so you can easily walk while your roommates are waiting in line. Near 7:00 or so they let us move up to the stop sign more on the Vista property, and then around 7:30 they actually started check-in. The people running check-in lead us to this building area with some canopies. There you wait in line just for a little bit, and then they check you in and make sure you have your correct phone number and email before you continue. Then, you go to the line that has the correct letter to your last name, and you get a label to put on your new DCP planner book about where you're working! I was freaking out. I was waiting with Sara, Bethany and Liz, and Sara went first. She's working in the Roaring Fork in Fort Wilderness Lodge! I was next. 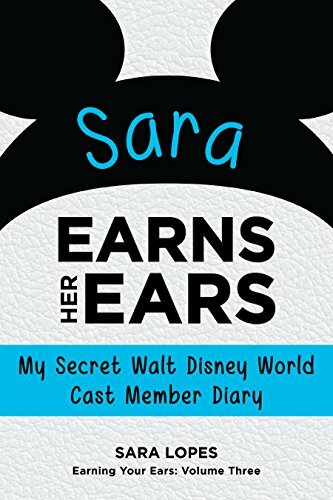 I was thinking I was getting Magic Kingdom because of the random pay increase I have compared to Sara, but I was wrong! I'm going to be working in Captain Cook's in the Polynesian Resort! Not gonna lie, I was a little disappointed I didn't get a park at first. But then I did some research on the location and the resort (I've never been!) and I'm really excited! This way I'll be exploring somewhere I've never been before, AND it's one of the only places that serves Dole Whips! I'm already in love with the idea of working in a Hawaiian themed resort. I LOVE tropical getaways and beaches, so I feel like this was a perfect place for me. My other roommates got their positions after me. Bethany will be working in FoodQuest (in DisneyQuest) in Downtown Disney, Liz is working on Main Street USA in MK for merchandise, Briana is working as Merchandise in the Contemporary Resort, and Sarah is going to be a tour guide/driver on the safaris in Animal Kingdom! After you find out your work location, it's paperwork, paperwork, and more paperwork. I recommend bringing a folder to keep everything together because I was starting to get a little scattered with all of my papers I had to keep with me. After beginning the paperwork process outside, we walked inside the building and requested a living location. We were hoping for a three bedroom in Chatham, but all they had available for us was either a three bedroom in Patterson or a four bedroom in Chatham (which is exactly the same rent price). We decided to go to Patterson, and my gosh it's SO nice!! We're literally ten steps away from the laundry, near the front of the entrance (so not too much walking to the bus stop), near the pool, gym, and clubhouse! The only thing that's a little far away is the mailroom, but that's okay. One of our roommates has a car, so if you have a car you're going to be filling out the insurance information and whatnot after you find out where you're living. Following this process comes your picture for your ID. Man, mine looks beautiful. Just kidding I look like a serial killer. Buuuut I can't expect much from two hours of sleep and gross hair from the humidity. Once we took our picture we went outside again to sign more papers and talk to people about classes and networking. This was the last part of the official check-in, so we were able to take a quick break and grab an apple or granola bar from the little snack area. (It's VERY minimal for snacks, I recommend bringing your own.) Then, we boarded the bus for casting. Casting was honestly mainly just exhausting. The bus ride over was fun, there was some Disney trivia and we finally got to see the entry sign to Walt Disney World. The casting building was pretty cool. The doorknobs were from Alice in Wonderland and the inside had a lot of historical Disney photos and statues of the characters. I didn't get a picture of the doorknobs but I filmed a little bit of the inside which I'll put in a video blog later. Casting is mainly just an immense amount of paperwork and background checks/fingerprinting. You'll learn more about where you're working and what they expect of you for Traditions. There was a lot of standing and waiting, so make sure you're wearing comfortable shoes that day. Your feet WILL hurt by the end of the day. After casting, we took the bus back to Vista, checked out of the hotel and drove to Patterson! Sara and I immediately took a nap. We were so exhausted. Later we started unpacking and got most of our supplies we needed at Walmart. Now our room looks like someone actually lives there! That's the majority of what happened yesterday. 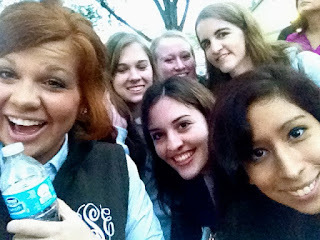 Gosh it feels like forever ago though. Check-in day is literally the longest and most exhausting day of my life. We don't have anything planned for today except to finish grocery shopping. We might even visit the resorts we're going to be working at! Tomorrow we have our housing meeting, and Friday is Traditions! I don't have training until bright and early Monday morning, which is nice because that means we have the weekend to explore and have fun in the parks!